Home More How To Mounting a Rifle Scope: Is Yours Too Far Back? Mounting a Rifle Scope: Is Yours Too Far Back? Many hunters mount their scopes too far back. They install it on a table or a shooting bench, not in the woods after a fast shot at a whitetail or on the steeps following an uphill poke at a ram. When you fire at game, you’ll likely lean into the sight; prone, sitting, and uphill shots put your face even closer to the sight. If you must pull your head back to see a full field or prevent the ocular ring from dinging your brow, the scope is too far back. The Sightron 1.5-5X on this Ruger Hawkeye Alaskan gives you fast aim, with plenty of eye relief to stop the .375’s recoil short of your brow. The scope must be mounted so aim comes naturally and immediately from a range of field positions; you see a full field at first glance, as soon as the stock hits your cheek. So, as you mount the scope, snug the rings gently, then throw the rifle up as if snap-shooting. Kneel, sit, flop prone on the ground. Chances are you’ll push that tube forward before you tighten those screws! For a crash course in all things rifle, including more great info on how to scope a rifle, order your copy of Gun Digest Shooter’s Guide to Rifles by Wayne van Zwoll today. 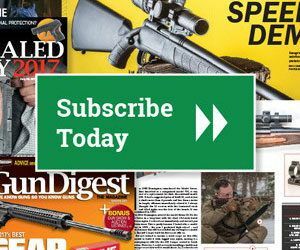 Thank you for reading the Inside Gun Digest Books blog!